As I previously announced, I am working on a third edition of Out in the Garage, which isn't significantly different, but it is an improvement on the previous editions for a number of reasons. See my previous post, Indie and Proud!, for more details on the changes. As it stands now, I am nearly finished with this final edition; however, I am considering making a couple of additional changes, which came to light while I was working on the ones previously outlined. 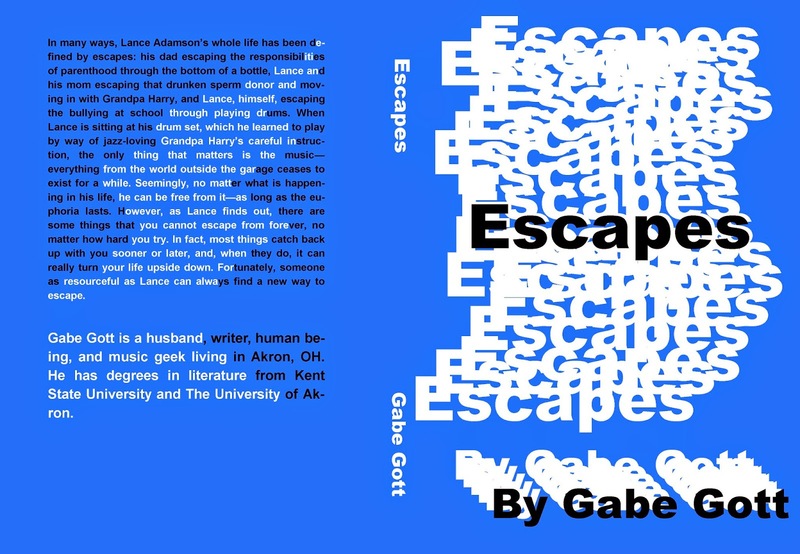 I am considering changing the title back to the original, pre-published title, Escapes, as it hits on one of the main themes, and might help to open up the novel to more people. While considering changing the title, I rewrote the description, and the new description really helps to elucidate the idea that I think was previously obscured, and it, coupled with the title, might also help to explain some of the more confusing aspects of the novel. That is not to say that I give anything away, but when a reader gets to those points, it will make a lot more sense. Out in the Garage, while a good, and definitely a unique, title, might be a little misleading, since it only seems to focus on one aspect of the novel, and doesn't really seem to encompass all of it, which Escapes does a better job of doing. Also, I have a new book cover design that I really like, and that adds to the artistry of the whole endeavor. I also think it is better than the original design, and it incorporates the change in title and the new description, as well. What do you think about the new title/description/cover design? In many ways, Lance Adamson’s whole life has been defined by escapes: his dad escaping the responsibilities of parenthood through the bottom of a bottle, Lance and his mom escaping that drunken sperm donor and moving in with Grandpa Harry, and Lance, himself, escaping the bullying at school through playing drums. When Lance is sitting at his drum set, which he learned to play by way of jazz-loving Grandpa Harry’s careful instruction, the only thing that matters is the music—everything from the world outside the garage ceases to exist for a while. Seemingly, no matter what is happening in his life, he can be free from it—as long as the euphoria lasts. However, as Lance finds out, there are some things that you cannot escape from forever, no matter how hard you try. In fact, most things catch back up with you sooner or later, and, when they do, it can really turn your life upside down. Fortunately, someone as resourceful as Lance can always find a new way to escape. If you need something to compare them to, check out the BOOKS Page for the originals. I am really learning towards the changes, but I haven't fully made up my mind yet. When I do, I will announce it.